A World of Paint Possibilities! Hello Friends, I have some Fabulous News! 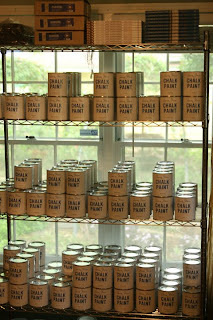 I was really lucky to win Anne Salone's Chalk Paint from Miss Mustard Seed's blog, generously donated by Lady Butterbug, from Texas, aren't those names just so darn cute! Miss Mustard Seed's blog is a "Must Follow" Blog. She is so Very Talented, a great inspiration, and super nice. and a wonderful wax brush, so of course I had to order the dark wax and another wax brush. Thank you, Thank you, Thank you Lady ButterBug and Miss Mustard Seed. My NEXT POST will be my Chalk Paint Project! I was already in progress with these end tables. I used Caromal Colours Reclaim Off White, for the Queen Anne legs. Reclaim is similar to Chalk Paint, No Sanding, No Priming, No Prep! for a quart of regular paint, but, I didn't want him to mix it with their paint. I just wanted to buy the tint, I think it was $1.19 and $3.00 for the quart size can. I picked out a beautiful, French Blue- it's such a beautiful color. I could of chosen from 1000's of colors, you know, on all the color samples they have on cards. I brought the tint home, and mixed it with my quart of Caromal Colours Reclaim Off White. It's a Primer, Finish, and Sealer- All In One! I brushed it on the table top and drawers, took the hardware off, but painted with the same paint. I brushed on Caromal Colours Chipping Cream. After it was dry, I brushed a very thin coat of Reclaim Off White. When dry, I took a 3M sanding pad, and sanded some of the Off White. I wanted just a little of the white to show through, here and there. The look was awesome, the Chipping Cream, allows for the under lying color to show through. The sanding went very quickly. the same for the top. I love the look, they are already for sale at "my petite shop"
Next time, I'll take pics as I go. but I will, cause I want you to see how easy it is. to see other painted pieces and get some ideas. you can also purchase Caromal Colours paint there. I am also selling on Etsy under Caromal Colours. I don't have all the colors listed yet, but they are available to you. Please enter coupon code jan you'll get a discount in shipping. Another perk, no tax, outside of Pennsylvania! I'd really appreciate it if you let them know you heard about them through me. They are a growing family business, and great folks! Looky Looky Looky .........What I won! and I hit the Jack Pot baby. French Inspired, No Sanding, No priming! hosted a blog give away, and I won! 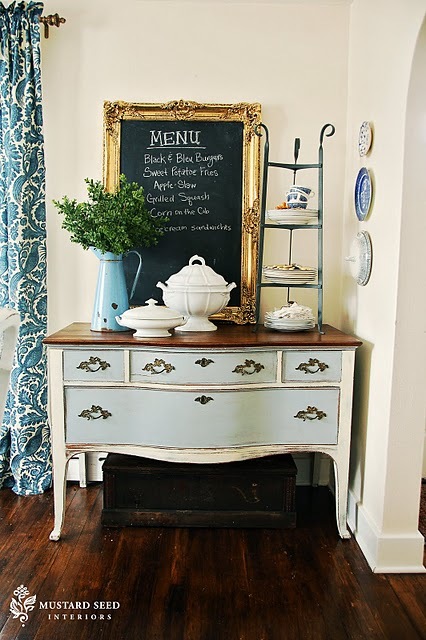 buffet, she finished using Chalk Paint. it is a Must Follow Blog, she's so very talented. I have room in my heart for two loves! 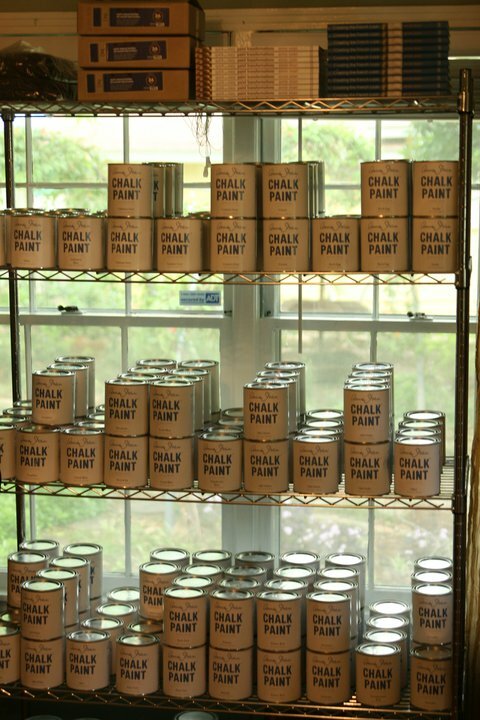 with my new love, Anne Salone's Chalk Paint. I've taken a little redirection with my art and time. Last year I became a rep for Country Living's Caromal Colours. cause I was so into creating my dolls. I'm not giving up doll making, just acting on another passion. Fabulous finds, upcycled, and painted with Caromal Colours. The best part about Caromal Colours is, you don't have to sand or prime before painting. It bonds to almost anything and is very durable. Antiques Downtown, Elk River, MN. I have another blog about Caromal Colours, http://BushWoodArt.com but it's on WordPress, and I'm so busy painting and finishing pieces with Caromal Colours, and still working part time at the hospital, I haven't had time to learn how to use it! So, I decided to do what I know how to do, and here I am, posting about CC here. But if you want more info on Caromal Colours, please order through my other web site. You will get a discount in shipping, and I will get credit. Thanks! then I dry brushed some Parchment basecoat. I added some tin squares to a flower box, and painted it with Caromal Colours Reclain- white. I have been a antique, thrift shop. estate sale, garage sale junkie since I was a wee one. Lucy, my mom got me into it. It drives my husband John, crazy. He's one of those people who just don't get it. But he loves me, so he puts up with it. He cringes, every time he walks in our garage. I don't blame him. I started out with a 12' X 10' room in our lower level, bead board walls, great lighting and tons of shelves. Then when our last son moved out, I took over the family room, 21' X 20', and now the garage! It's only temporary, I am planning on just working out of the family room/work room/studio. Vintage mounding with iron hangers. Last but not least, a little vintage romance, a pretty altered hand mirror. Well, I'm off to deliver these to my shop space. You can also buy Caromal Colours on Etsy, click on the right side bar, top of page. I am in the process of listing all the colors, one more thing to add to my "to do" list!